As our taxi weaved in and out of traffic, driving much faster than was wise and honking unnecessarily at every passerby, I couldn’t help but smile and think “this guy is either absolutely fearless or totally insane!” But it wasn’t just him. It was the family of five balanced precariously on the back of a rusty old motorbike and the elderly lady dashing across the highway narrowly avoiding the cars whizzing by. And slowly but surely, that fearlessness crept it’s way into me as well. Cairo has that effect on you – it awakens all of your senses and gives you this energy, it makes you feel truly alive. It only takes a day or two to get used to the persistent taxi drivers, the smells that can either be horrifying or intoxicating, the constant traffic and honking of horns, and the curious locals that exclaim “welcome to Egypt” excitedly and then request to take a photo with you. And it doesn’t take long to become totally, completely captivated by Cairo! Cairo is the capital of Egypt as well as the largest city with a population of approximately 6.76 million (with an additional 9.5 million living in close proximity). Most people associate Cairo with the nearby Pyramids of Giza and the Sphinx, the Nile Delta, King Tut, Pharaohs, mummies and “walking like an Egyptian”. You’ll find all of that and much more in this massive, sprawling metropolis. For everything you need to know before you go, and once you arrive, you’ve come to the right place! The currency in Egypt is the Egyptian Pound (LE). At the time of writing (November of 2017) the conversion rate was about 17.65 LE to $1 USD. We’ll be referring to costs in Egyptian Pounds so just keep in mind that if we say something costs 100 LE, that’s just about $5.50 USD. Each Egyptian Pound is made up of 100 Piastres and the bills look similar so familiarize yourself with both. The prices appear to have gone up significantly. But they haven’t. The value of the Egyptian Pound has fallen drastically since 2016 and prices have been increased to reflect the change. The following countries can obtain a visa on arrival at Egyptian ports of entries: USA, UK, EU Nationals, Australia, Canada, Croatia, Georgia, Japan, New Zealand, Norway, Macedonia, Republic of Korea, Russian Federation, Serbia, and Ukraine. The price is $25 USD/person and the visa can be purchased at the currency exchange counters before you reach passport control. If you don’t have US dollars, don’t worry, you can also exchange your currency there. Egyptians speak Arabic and you should learn a few key phrases to get around! “Al Salam Alaikum” (pronouned sall-em wall-a-come) is a nice way to say “hello”. “Shukran” (pronounced shoo kran) is “thank you”. “Ma’-Elsalama” (pronounced ma sell lem-a) is “goodbye”. And “tip” is “baksheesh” – you may get asked for one every now and again. Islam is the official religion for 90% of the population and most of those are Sunni Muslims. As with most conservative countries, women are expected to cover their knees and shoulders when venturing out of the house (although this is not necessarily the case in upscale neighborhoods). Foreigners are only expected to cover their heads when entering mosques. Remember, you’re not here to change the culture, you’re here to experience a new one. Friday is the Muslim holy day and you’ll find that many stores are closed. Buses run infrequently, if at all, on Fridays. We have an entire article about what I wish I had known before visiting Egypt. Forget everything you’ve heard about how “dangerous” Egypt is and don’t take everything you read at face value. While there are some areas that are still a bit seedy, including the Northern Sinai Peninsula (so we would not recommend a land border crossing from Israel), you’ll find that most of Egypt is full of kind, welcoming people who want to learn about you and take a photo with you, and complete strangers all over the city will be concerned with making sure you feel safe. Prior to visiting I read a lot of blog posts that warned of “passive aggressive groping” (where men pretend to brush by your bum) and endless catcalling. And warned that women should avoid eye contact with men as it would be perceived as flirting. Well, the only touches I received from men were friendly handshakes and the worst of the catcalls was “how many hearts have you broken today?”. The only time I felt uncomfortable was when I was surrounded by school children requesting selfies and my cheeks were in physical pain from smiling too much. Is Egypt safe? Absolutely! While bad things can happen anywhere and everywhere, I never felt unsafe not even once during my time in Cairo. 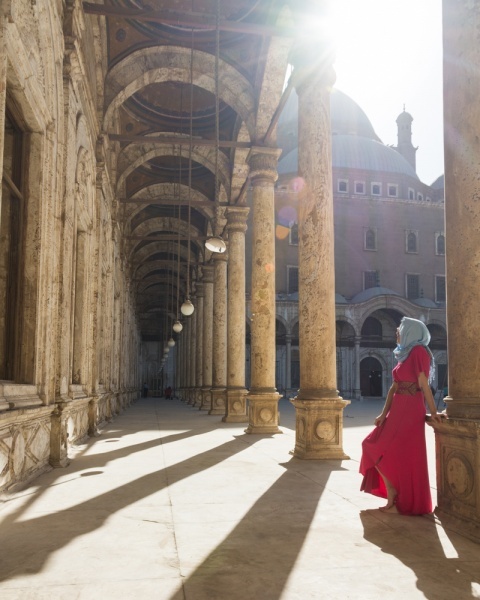 Side Note: I traveled to Cairo with my husband and while I didn’t get the feeling that I would be uncomfortable in any situation without him, solo female travelers may attract more attention from men. October until April is considered high season in Cairo as the weather is more bearable than the sweltering summer months. High temperatures in the winter months range from 57-72°F and in summer the highs can reach 104°F. Rainfall is sparse. During the off season you’ll find that tourist sites are less crowded and prices are generally lower but you’ll likely want to find a pool around mid-day. TIP: If you happen to visit Egypt during the holy month of Ramadan, you’ll find a very different atmosphere. During that month, which takes place in the ninth month of the Islamic calendar, Muslims must fast from dawn until dusk. Because they are only allowed to work 6 hours/day most businesses operate on a reduced schedule. Egypt is probably one of the cheapest countries we’ve visited to date. Our 45-minute Uber ride from Cairo to Giza cost us less than $3 USD. Our thick American brains cannot figure out how the price of both gas and time could possibly make that trip worth it for the driver! We ate huge, delicious meals for about the same price as the taxi. It’s worth it to opt for luxury accommodations in Egypt as your money will go a lot further here than you’re probably used to! As mentioned earlier, women are expected to cover their knees and shoulders but Egypt can be incredibly hot! Long, comfortable pants, button-down shirts, long dresses, and a scarf to cover your head when you enter mosques are recommended. The Cairo International Airport (CAI) is a hub to get to/from Cairo and Giza. Giza is just a short 30 minute drive from Cairo so it’s easy to do as a day trip if you’re short on time although we would highly recommend spending a few days in each place. Uber has made it’s way to Cairo! Taxis are everywhere but, as with other large cities in the world, taxi drivers prefer to keep rides for tourists off-the-meter. Regardless of your method of transportation, getting around Cairo is incredibly inexpensive unless you hire a guide to accompany you. If you decide to rent a car (or even just end up in a car at night) you’ll notice that many people drive with just their low beams on, or no headlights at all. Some Egyptians believe that headlights make driving more difficult at night and have been known to get irritated with drivers who don’t comply. Also, we would NOT recommend renting a car unless you are well-versed in navigating lawless roadways. We were on a mission to find a dent-free vehicle anywhere in Cairo to no avail. TIP: Hiring a driver to take you to the sights around Cairo is fairly common. You can expect the price to vary considerably depending on if you just hire a driver or if you have an English-speaking guide to show you around as well. We even ran into one couple who had hired a private security guard to accompany them on their tour of Cairo. Of course a tip will be expected so plan on an extra 50-100 LE depending on the length of time that you spend touring the city. There are hundreds of places to stay in Cairo but there is only one that offers 5-star luxury in a garden oasis on an island right in the middle of this big, bustling metropolis. The Cairo Marriott Hotel sits on 6 acres of amazing gardens on Gezira Island and provides a tranquil reprise from the city chaos outside of it. The original building was a palace, constructed in 1869 by the ruler of Egypt, Khedive Ismail. 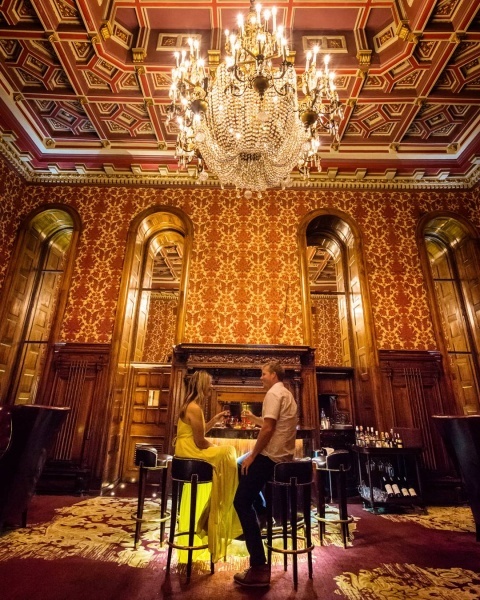 The Marriott gained management of the property in the 1970’s and has done a fantastic job of preserving the history and architecture of the palace while adding modern day luxuries. 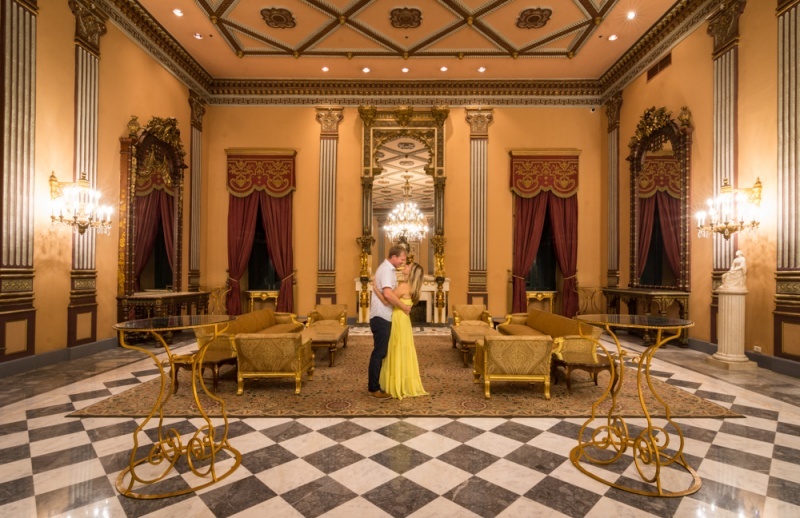 Elaborate restaurants, ballrooms, and lounge areas filled with ornate gold mirrors, plush carpets, intricate latticework, and beautiful artwork throughout create the illusion that you have stepped back in time and gained royal status. Large conferences and lavish weddings are commonplace here, and for good reason. The property is absolutely stunning! Wake up every morning and enjoy a cup of coffee from your spacious balcony overlooking the Nile River and then head downstairs to try their lavish breakfast spread. You’ll find everything from traditional Egyptian flavors, made-to-order omelettes, a selection of charcuterie, cheeses and breads, and everything else in-between! And with 14 delicious and diverse restaurants and bars, a state-of-the-art fitness center, an inviting pool, and even an in-house casino you may never want to venture off the property! 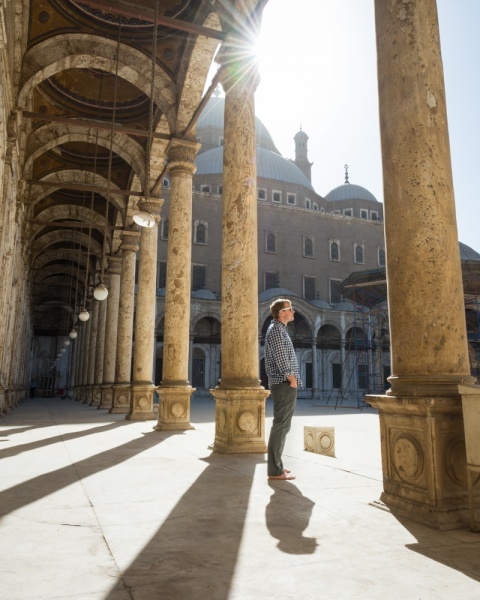 But if you do decide to explore more than just the Cairo Marriott, we’ll tell you everything you need to know in order to see all of the highlights of this sprawling city. TIP: Keep small change on you to tip the bellboys, the housekeepers, and any other helpful hotel staff members. Koshari – you might think that the person who created this dish hadn’t been to the grocery in a while and just threw everything they had left in the cupboard into a pot. Often referred to as a “poor man’s dish”, koshari is made of rice, macaroni, lentils, chickpeas, onion, and tomato sauce and tastes a bit like spaghetti (but better). Hamam Mahshi – don’t let the fact that this dish is actually stuffed pigeon turn you off. Sure Americans refer to pigeons as rat birds but we also can’t live without bacon which comes from garbage-eating pigs. You can’t leave Cairo without trying this specialty! Fiteer Baladi – Egypt’s version of pizza (but a bit less healthy, if that’s even possible) is layers of buttery, delicious filo dough either served plain or stuffed with savory or sweet fillings. Shawarma – this is a staple all over the Middle East and for good reason – it’s delicious and cheap! But some might argue that the best shawarma can be found in Egypt. Be sure to try some while exploring the city. Taamia – quite similar to the classic falafel but made with split fava beans rather than chickpeas. Ful – a simple dish of cooked fava beans served with oil, cumin and other spices, and occasionally topped with tahini. Eat it like chili or as a dip for your pita bread! 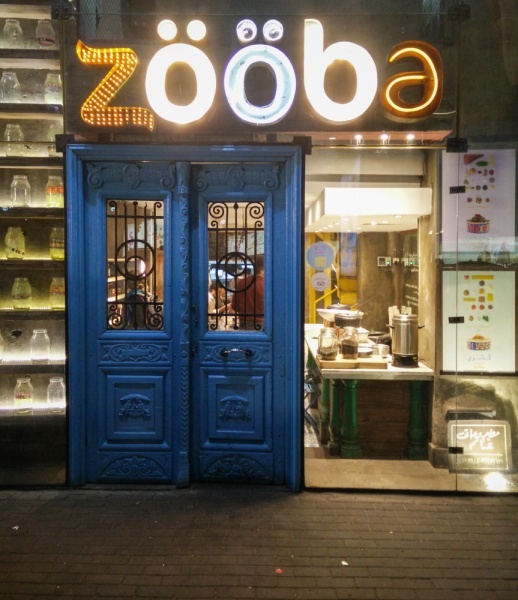 You can try quite a few Egyptian specialties at Zooba, also located on Gezira Island. Try the Classic Koshari, the Ful, and the Spicy Pepper Taamia – this filling meal will cost you less than a burger at McDonalds! 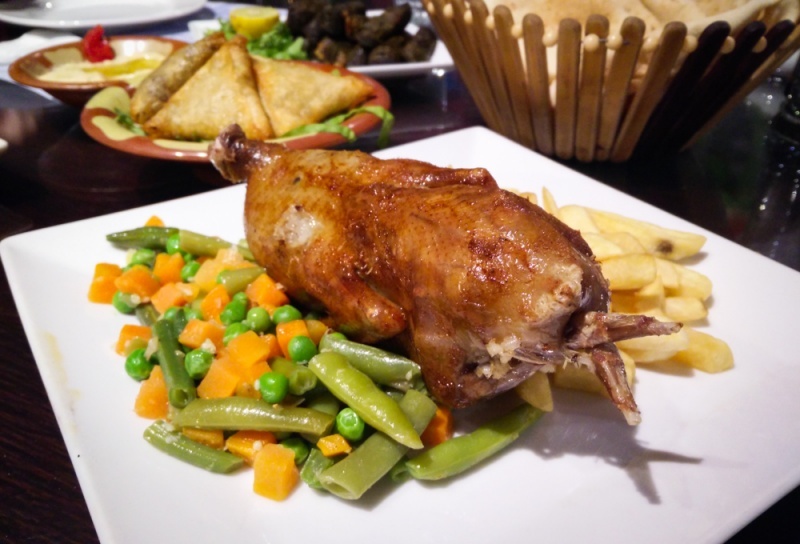 For stuffed pigeon right in the heart of the bustling Khan al Khalili market, try Naguib Mahfouz. If you can’t stomach pigeon, you really can’t go wrong with anything on their menu. The Garden Promenade Café in the Cairo Marriott gardens is a popular spot among Cairo’s elite for a casual lunch or dinner . They offer classic American dishes with stunning views of both the palace and the courtyard. 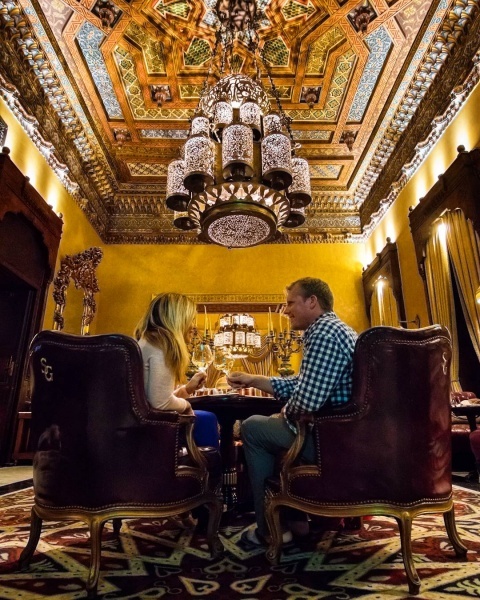 For an upscale, immaculate 5-star dining experience while being serenaded by soft piano music, Saraya Gallery is a lavish restaurant located inside of the Cairo Marriott. Start with the traditional French onion soup, the slightly spicy nicoise salad, and a glass of Egyptian chardonnay. 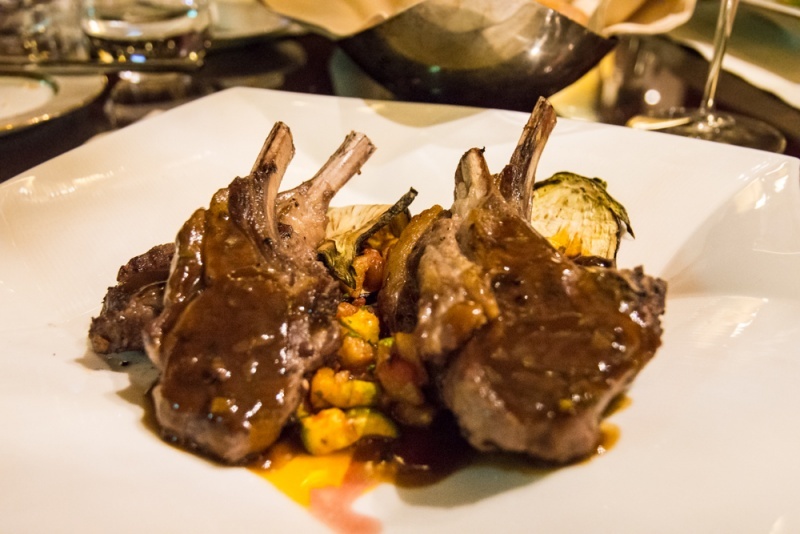 For your main course either the rack of lamb or the filet of fish in hollandaise sauce are spectacular. And don’t dare leave without sampling their creme brulee trilogy! TIP: A 10% tip is customary for servers in Cairo although many restaurants add a service charge to your bill. If that is the case you may give a bit extra if your server went above and beyond. In Islam, the consumption of alcoholic beverages is generally forbidden in the Qur’an but some choose to imbibe depending on personal beliefs. You won’t find as much of a “bar scene” here as in Europe or the US but there are plenty of restaurants and bars that cater to foreigners. You’re more likely to find Egyptians smoking shisha (flavored tobacco out of a water pipe) than drinking alcohol so we’ve recommended a few good spots to partake if you so choose. Billiard Bar is nestled away behind the Saraya Gallery Restaurant on the ground floor of the Cairo Mariott. Due to it’s hidden location, mood lighting, and lavish decor, it feels a bit like stepping back in time and into a speakeasy. Cairo Jazz Club is a fun place to catch a live show and rub elbows with the young and hip of Cairo. If you plan to arrive after 10:00pm a reservation is recommended. The Tap Maadi offers a casual atmosphere, good food, and lively nightly entertainment. Sugar & Spice is nestled in the middle of a trendy shopping area just west of Gezira Island. Fancy coffee drinks, comfortable chairs, and shisha make this a popular spot with the local Egyptian women. Egyptian Nights is also located inside of the Cairo Marriott and offers authentic Egyptian food, nightly entertainment, and shisha. It’s the perfect late night hangout! Don’t Miss These Top Sites! 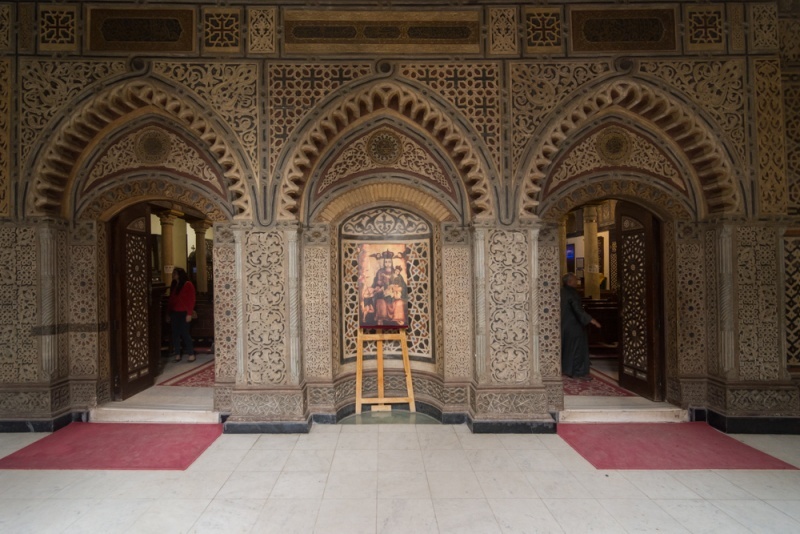 Coptic Cairo – a unique area within Old Cairo containing six churches that date back to the early Christian Era between the pharaonic religion and the arrival of Islam. The Egyptian Museum – containing approximately 160,000 items, this museum houses the world’s most extensive collection of pharaonic antiquities. (Open 9:00am – 5:00pm every day. Entrance fees: 120 LE/person for just the museum or 240 LE/person to visit the mummy rooms as well. Thursdays and Sundays the museum is open during the evening from 5:30pm – 9:00pm but you’ll pay a higher entrance fee. If you want to take photos with a camera you’ll be charged an extra 50 LE for photography and 300 LE for video). 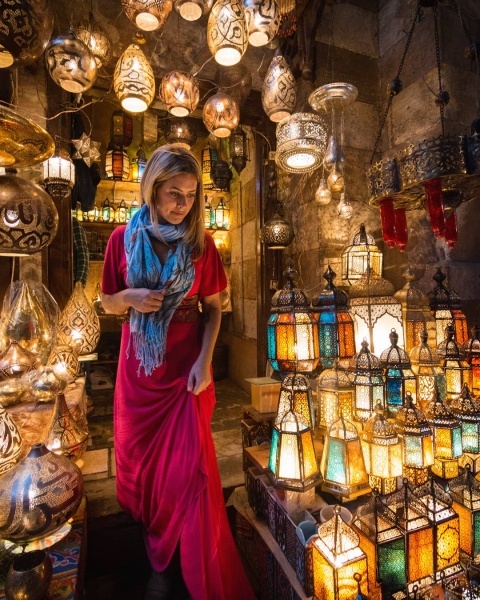 Khan El-Khalili – a large market that offers typical Egyptian souvenirs that tourists will go nuts over. Don’t forget that their first offered price is never their final price! Mosque-Madrassa of Sultan Hassan – this mosque was commissioned by the Sultan Hassan who ruled over the region twice – once at only 13 years old. Construction began in 1356 AD and was completed 3 years later “without even a single day of idleness”. Amr Ibn Al-Aas Mosque – originally built in 641–642 AD, it is the first mosque built on the African continent. Start your day with the delectable breakfast spread at the Cairo Marriott Hotel (known as the best breakfast buffet in all of Cairo), then call an Uber to the Citadel of Cairo located at the top of Mokattam Hill (this may quite possibly be the cheapest Uber ride you’ve ever taken in your life). Don’t forget a scarf – you’ll be checking out several mosques today and you’ll need to cover your head. Not only are the views of the city stunning from the top, but you’ll also find plenty of mosques and museums to keep you busy for a few hours. The Mosque of Muhammad Ali was built between 1830 and 1848 and it’s courtyard originally contained the tomb of Muhammad Ali Pasha who is considered by many to be the founder of modern Egypt. 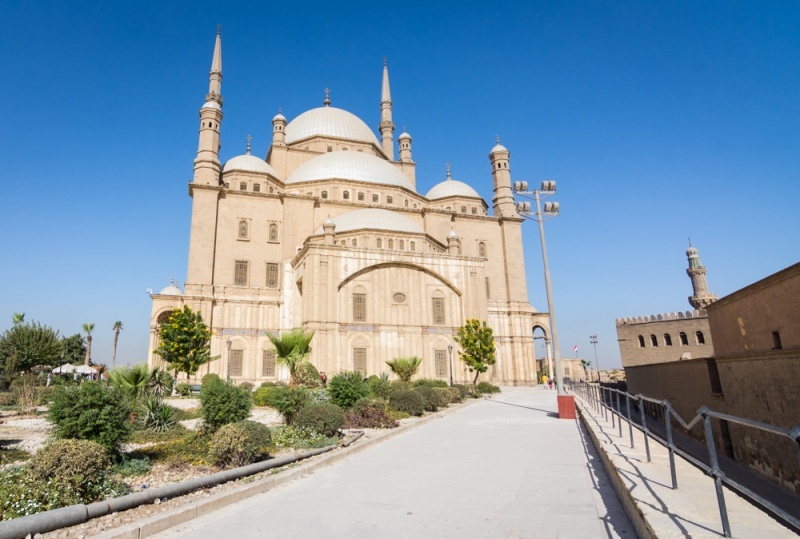 The Al-Nasir Muhammad Mosque was built in 1318 and was used by sultans of Cairo for Friday prayers. The Mosque of Sulayman Pasha was established in 1528 and was the first to be designed in an Ottoman architectural style. All three are gorgeous, both inside and out, and definitely worth a visit. You can also visit the museums at the Citadel including the Al-Gawhara Palace Museum which was commissioned by Muhammad Ali Pasha in 1814, the Royal Carriage Museum which contains a collection of unique royal carriages, and the Egyptian Military Museum which was established in 1937 and is the official museum of the Egyptian Army. Although at the time of writing it was closed for renovation. When you’ve had your fill of the Citadel, head downhill towards Al-Azhar Park for an nice afternoon stroll en route to the Islamic Cairo neighborhood. 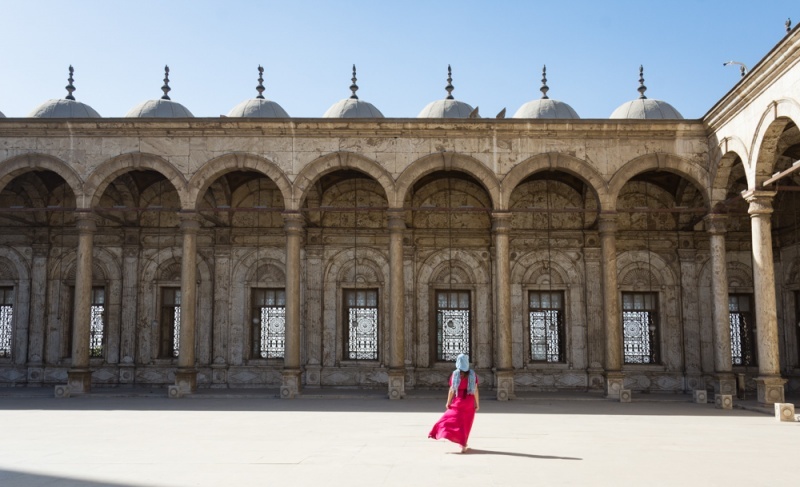 The two major sites in Islamic Cairo include the Mosque-Madrassa of Sultan Hassan and the Al-Rifa’i Mosque. Both the interior and exterior of both mosques are stunningly picturesque. Step inside but don’t forget to cover your head and remove your shoes and note that the man guarding your shoes will ask for a tip – the smallest bill you have should suffice (no more than 10 LE). 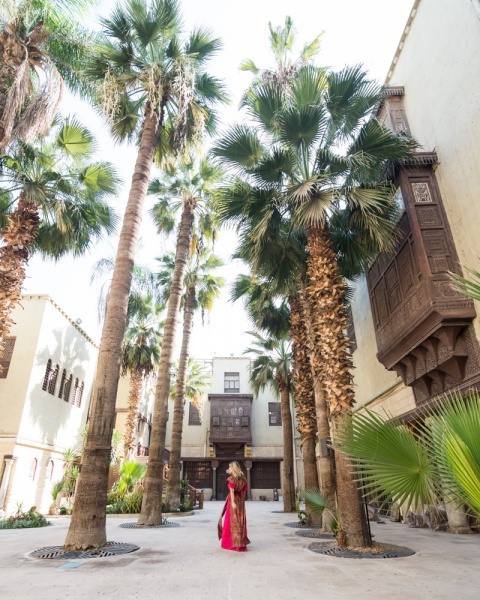 Once you’ve wandered around the courtyard for a bit, head to Al Moez Ldin Allah Al Fatmi Street which offers souvenir shops, beautiful buildings along the way, and excellent people watching if you’d like to rest your feet and drink a tea. This is also where you’ll enter Khan el-Khalili, the market that caters to tourists hoping to find classic Egyptian souvenirs. End your day with dinner and drinks at Saraya Gallery! Again, you’ll want to get an early start today! Fill up on breakfast at the Marriott and then catch an Uber to the Egyptian Museum where you’ll pass through 3 security checkpoints just to get inside the courtyard (who says Egypt isn’t safe?). 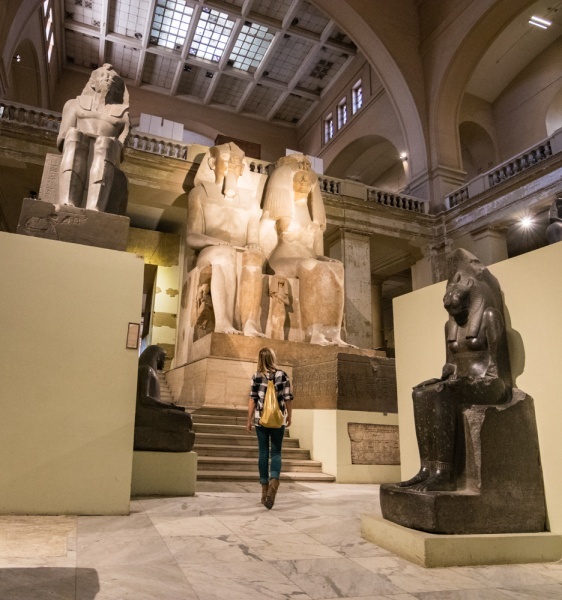 Pay the entrance fee at the ticket counter – be sure to pay the small additional fee to enter the mummy rooms, they are a highlight – and then decide if you’d like to opt for a guide for an additional 200 LE. The museum is poorly signed so if you want to have any clue as to what you are looking at, you should definitely hire a guide. But if you don’t, you’ll still have a wonderful time wandering around the 107 halls filled with artifacts from the prehistoric period through the Roman times. This museum is literally overflowing with Pharaoh and Sphinx statues, mummified remains of both people and animals (including a massive mummified crocodile! ), and intricate gold jewelry that managed to escape the hands of tomb raiders. So much so that many statues are pushed off to the side and forgotten. And very few places inside the museum are off-limits. You’ll undoubtedly see people wrapping their arms around the statues for a selfie (but of course you should be a responsible tourist and refrain). Don’t exhaust yourself before seeing both mummy rooms as well as the room filled with treasures from King Tut’s tomb! You’ll likely spend several hours in the museum and feel exhausted by the time you leave. On your way out, stop at Tahrir Square, known for being a place for political demonstrations in Cairo including those leading up to the 2011 revolution. Spend the remainder of your day relaxing by the pool at the Cairo Marriott but head back out later in the afternoon to watch sunset from the top of the Cairo Tower. You’ll be treated to breathtaking city views with a spectacular pink sky backdrop! You’ve got a lot of churches to explore today so don’t forget a scarf. Today is the day to explore an area of Old Cairo known as Coptic Cairo. There was a time in Egypt between the decline of the pharaonic religion and the rise of Islam when there was a Christian majority. And contained within the Fortress of Babylon are a concentration of Christian churches as well as a museum that holds the largest collection of Coptic Christian artifacts in the world. Catch an Uber to the Hanging Church which is one of the oldest churches in Egypt and will be the first stop on your tour of the area. Coptic Cairo is small, contained area so you should have no problem walking to each site after being dropped off. Next head to the Coptic Museum (open from 9:00am until 4:00pm. Entrance fee: 100 LE/person and an extra 50 LE if you want to take photos) where you’ll find beautiful stonework and Christian icons as well as the oldest known book of Psalms. 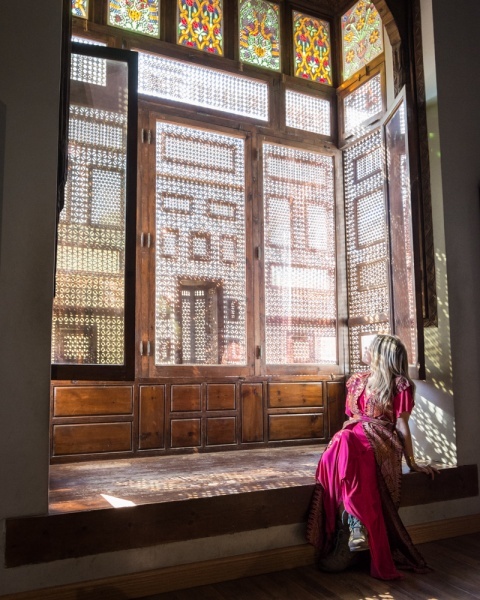 But the real highlight of the museum is the building itself – the stained glass windows and intricately detailed ceilings and windows really steal the show. Next don’t miss the Greek Orthodox Church of St. George which was our favorite of the church tour. Then take a trip through the Coptic Cemetery where large, elaborate tombs are sagging and crumbling with age. Head back the way you came, exit the gate by the Church of St. George and take the descending staircase that leads through the Coptic Cairo Bazaar. You’ll find a small alleyway that will take you to the remaining churches on your list. 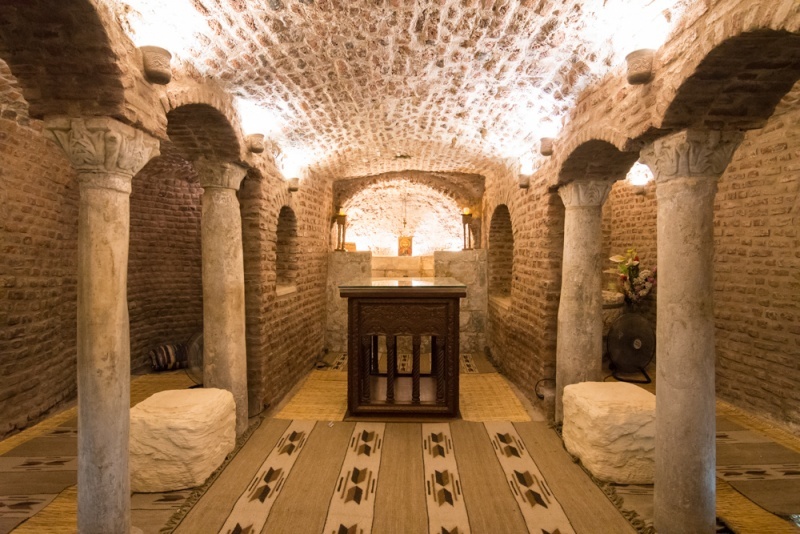 The Church of St. Sergius and Bacchus which dates from the 5th century boasts a cave in the basement of the church that supposedly sheltered Jesus, Mary, and Joseph for 3 months during their time in Egypt. Supposedly baby Jesus lived here for 6 months – nice digs! The Ben Ezra Synagogue is at the end of your alleyway tour and is the oldest synagogue in Cairo. 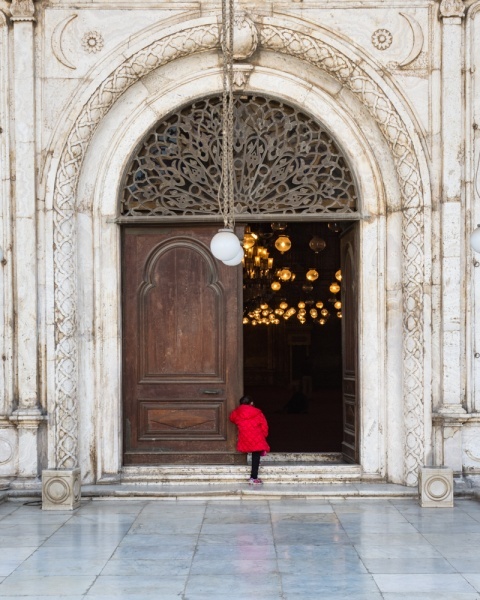 Head back up to street level and be sure to visit the Amr Ibn Al-Aas Mosque before you depart Coptic Cairo – it was the first mosque built on the African continent. Day Four: Head to Giza to Explore the Pyramids! Giza is just a short cab ride from Cairo and possible to do as a day-trip if you are short on time. But spending a night or two in Giza means you’ll be able to watch a spectacular sunrise and sunset in the shadow of the legendary Pyramids of Giza! 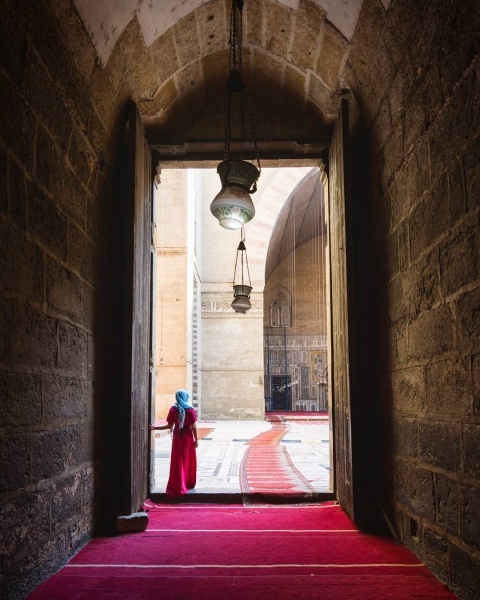 Any other captivating Cairo treasures that we missed? Comment below so we can add them to the list! Planning a visit to Egypt? Check out our favorite books! Previous Post How to Become Insta-Famous: Just Pack These 19 Simple Accessories! Loving the pictures and outfits. The hotel looks amazing although I stayed at the Meridian pyramids which as you can imagine, had views of the pyramids so was pretty happy there. The Egyptian Museum is on my list of the top five museums I have ever visited. It is incredible. So much so that I even visited twice and I am not a fan of museums generally. Did you have a guide for the museum? We didn’t and we were so confused about what was going on! Lol. I went to Cario, years ago and was blown away by the Pyramids. 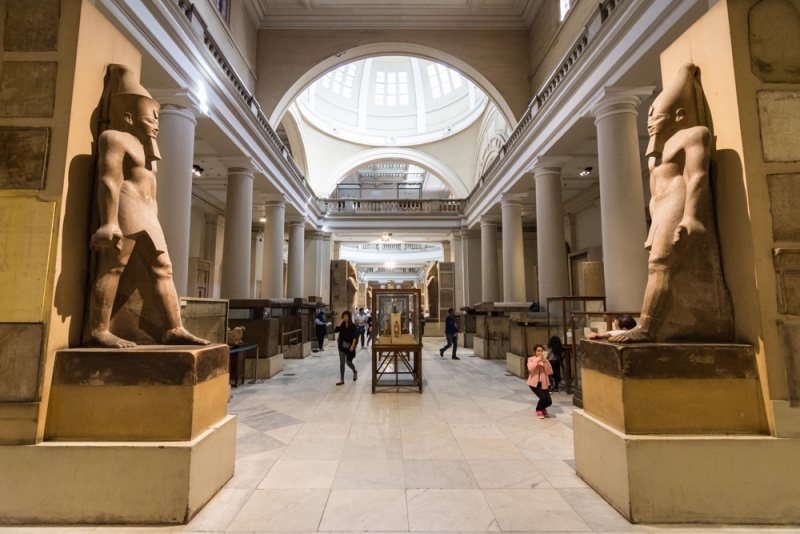 The Egyptian Museum is fascinating, apart from some of the artifacts are in the British Museum in London, so I had to go there to see the rest! 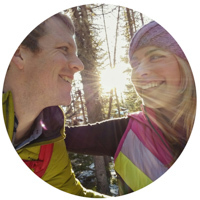 The Marriott Hotel looks beautiful and your photos you took on the grounds are lovely. I wouldn’t mind staying in a palace and I cannot believe Uber is in Cario! After visiting Marrakech I’d love to explore more of northern Africa . The Cairo Marriott has got to be the most luxurious Marriott I’ve ever seen. This is a great guide for a first time visit to Cairo. 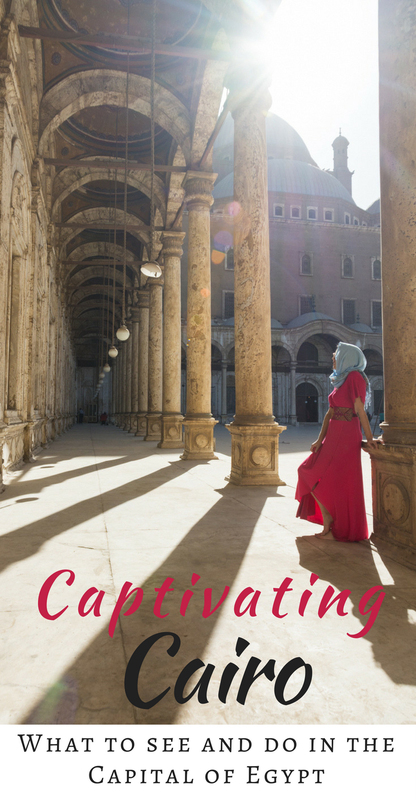 This is such a great comprehensive guide to Cairo, and the photos are stunning too! Such a good idea to pack a red dress, makes everything fabulous! Thanks for such a complete guide! I feel like I am all set and ready to go for a trip after reading this post! Don’t even have to do much extra research! Also, the Cairo Marriott Hotel looks absolutely gorgeous! Would definitely want to stay there if I go! Cairo has been on my bucket list for quite a while. I was told that it is a lot more expensive than it used to be so thanks for pointing out that the value of the Egyptian pound has dropped. First of all, what a well made comprehensive guide to Cairo. Bookmarked in case my travels take me there. $3 for a 45 minute Uber ride! That’s crazy! The Cairo Marriott looks pretty fabulous! Ever since I was a teen I was fascinated by Egyptian culture. Pharaohs, pyramids, the Sphinx, the Nile, and hieroglyphics. I’m glad you touched on safety with regards to the people but I’m concerned about safety with regards to extremists. As Cairo was just recently in the news. When I hear those stories it makes me put the breaks on visiting. I know the news exaggerates stories but how can you be sure. When I do go I will refer to this post as a guide.